Undoubtedly, prestige designs are the most highly regarded art forms to come out of the Moorcroft kilns. A few years ago, a photoshoot taken at Blackwell The Arts and Crafts House showed how Nicola Slaney had so excellently designed her Talwin RM3 vase that it fitted with absolute perfection into one of the most famous Arts & Crafts rooms in the world today, The White Room. BUY NOW, Talwin Prestige on the RM3 shape, open edition. There are a few pieces still available, click Talwin Ginger Jar to view the sales details. The high acclaim of prestige peices of Moorcroft has been the same since William Moorcroft danced one of his most melancholic tunes with his Moonlit Blue design, created as the dark clouds of World War 1 loomed. As many Moorcroft faithful will know, in 1913 William left the commercial pottery MacIntyre & Co to set up his own pottery in Burslem. Money came from Liberty, the famous London store and Liberty continued to control Moorcroft until 1962. He worked closely with his employees, personally overseeing the design of all pieces. Early wares were limited in colour, owing to William's inexperience with underglaze colours, but he later expanded to a much more extensive range, employing the use of richer, deeper colours that achieved a greater boldness than his earlier designs. For the later years of his life, William was preoccupied with developing glaze effects, which he used to enhance the look of many of his patterns. Since the opening of his pottery, William collaborated with the London department store Liberty. He worked with the company to produce designs such as Flamminian and Claremont. His most popular pattern is said to be Pomegranate, while others like Eighteenth Century and the landscape pattern Moonlit Blue are amongst those highly prized by collectors today. In truth, William's son, Walter Moorcroft, followed his father in creating, for the most part, floral designs in the family tradition - William's own father, Thomas Moorcroft, was a botanical artist. Yet like his father, many perceive the rare prestige landscape design, After The Storm to be his greatest work. After the Storm was created as a limited edition long after Walter had retired, to commemorate the firm's centenary in 1997. Sadly, Walter died in September 2002, but his lasting epitaph are the pots that, together with those of his father, adorn the shelves and china cabinets of the Moorcroft faithful. Although After The Storm was not as large as the other colossal prestige designs, prestige designs are often pieces not only prestigious in size, but often with highly intricate, complex and captivating design subject matter. After The Storm evokes the deep emotion of the man who had been at the helm of Moorcroft for decades - in short, it is from another dimension. Due to the very nature of their size, which can be up to almost 70ms in height, it can take many weeks for a single piece to be made from start to finish. For this very reason the majority of prestige designs are made to order, due to limited capacity at Moorcroft’s 1913 factory in Stoke-on-Trent, but each piece is certainly worth waiting for, as few can surpass a Prestige Moorcroft vase. The Glasgow School of Art by Emma Bossons FRSA. A vast array of prestige vases made over the past 100 years can be seen on display in the Moorcroft Museum, each a breath-taking example of Moorcroft art pottery. The Jerusalem vase created to commemorate the new millennium in 2000, sold out within six weeks, each piece priced at over £11,000. In more recent times, Prestige designs have been on display at the Lord Mayor of London’s Mansion House, Kensington Palace, Blackwell the Arts and Craft House, Cannon Hall, and The Potteries Museum and Art Gallery, with pieces such as the Glasgow School of Art creating international attention, as an homage to Charles Rennie Mackintosh following the first fire at the Glasgow School of Art. This piece is even more poignant now, following the utterly tragic second fire which burnt the colossal Arts and Crafts building to the ground the evening the Moorcroft Collector's Club attended 78 Derngate to celebrate a new Collection to mark the great man as part of his 150th anniversary of the birth of architect and designer Charles Rennie Mackintosh. The Glasgow School of Art is regarded as Mackintosh’s architectural masterpiece. One of the most influential buildings ever constructed in Great Britain. It combines his love of nature, with his travels to Italy and Europe. Art Nouveau style influenced his designs greatly. The school was built in two phases – the East Wing in 1897-1899 and the West Wing from 1907-1909. When one considers Emma's design, you cannot help but notice the stylised Mackintosh angels. We hope these angels will ensure that this beautiful architectural structure rises from the ashes once again. 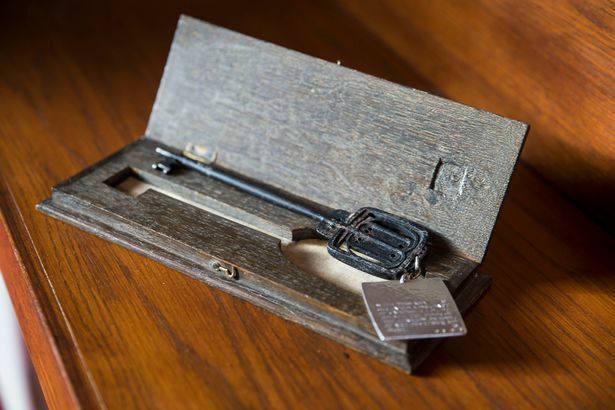 Indeed, a ceremonial key designed by Charles Rennie Mackintosh and used to open Glasgow School of Art (GSA) was auctioned off in February to help raise funds for the building's restoration. Experts said the key has not been seen in public since the opening ceremony in 1899. It was presented to Sir James King, then Lord Provost of Glasgow, after the front door of the renowned building was unlocked.The key was passed down through the King family to the current day Sir James King who hoped its sale would encourage others to contribute to the Mackintosh Campus Appeal and help restore the building following a fire in 2014. Let us pray that many unlock the key to funding the future of the Arts at this great national treasure. Sir James said: "If this beautiful and symbolic key can help unlock even just a little support from today's entrepreneurs to restore Glasgow's cultural masterpiece in its School of Art, it will have done its job inspiring future generations." 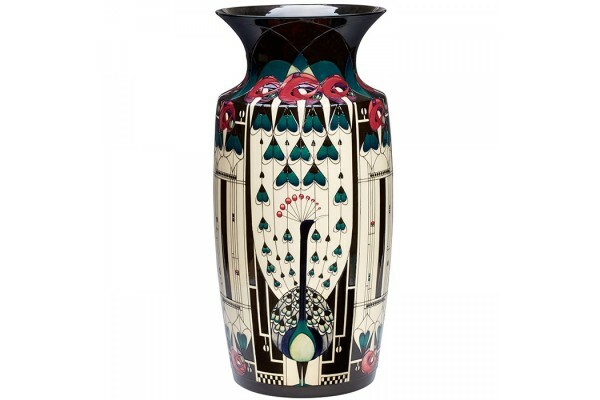 As part of Moorcroft's new prestige collection, The Glasgow Peacock, which made its debut at the 78 Derngate celebrations, stands proud.This colossal numbered edition vase by Nicola Slaney, was inspired by the famous Tea-rooms of Glasgow. They were a particularly Glaswegian phenomenon at the turn of the century. These establishments were more extensive than their name suggests. They included tea-rooms, luncheon rooms for men and women, general luncheon rooms, dinner rooms, billiard rooms and smoking rooms. They provided Mackintosh with the opportunity for experimenting in design which was not always possible in his normal interior commissions. Of all Mackintosh’s decorative work nothing brought him greater fame than these remarkable interiors; indeed, few of his projects created greater interest at home and abroad. Commissioned to share with George Walton the decoration of both the Buchanan Street Tea rooms and the Argyle Street premises, by 1901 he had sole professional control over the tea-room projects. The Peacock Study for a mural decoration was created in 1897-1898. It adorned the walls of the luncheon room where stylised trees and peacock motifs were used throughout. Nicola’s proud peacock, fans his tail in full display, while his red plume is raised in a silent salute to the great designer. The Glasgow Peacock will, no doubt, become an iconic Moorcroft prestige of modern times - akin to The Lyrebird by Senior Designer, Rachel Bishop, that charmed our Australian friends during our 2017 Australian tour. Indeed the peacock has to be twisted and bent to capture the curvaceous demands of Art Nouveau design but the Lyrebird’s strange curvaceous tail and form embodies, in its very being, the very nature of Art Nouveau design in much the same way as the ‘surrealist’ platypus. Nicola knew this fact only too well and this is why she decided to design in The Glasgow School - masculine and yet utterly elegant, such a rare treat. Pictured right, The Lyrebird by Rachel Bishop.